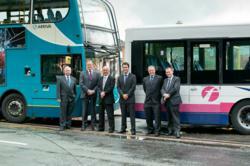 Quality comes to bus routes between Liverpool and Heswall and Liverpool, Birkenhead and Chester next week (July 8). Councillor John Salter and Alan Stilwell (Merseytravel), Howard Farrall and Richard Hoare (Arriva), Duncan McGraw and Jeff Clayton (First). Both bus companies are to be congratulated on joining in these partnerships with us which is part of our continuing efforts to provide the region with the best possible public transport service. Bus companies Arriva and First have joined forces with Merseytravel, Wirral Council and Cheshire West and Chester Council to improve and integrate services on routes 1, 3 and 401 to provide a better service between Liverpool, Ellesmere Port and Chester. And they’ve done the same on routes 71/72/171/172/472 which run between Liverpool and Heswall. Service numbers 71, 72, 171 172 and 472 will be combined to become the 471 and 472, and the 1, 3 and 401 will become the 1, 2 and X2. In what is termed a Quality Partnership there will be combined and co-ordinated timetables. This means on both routes a daytime bus every ten minutes throughout Monday to Saturdays daytimes with 30 minute services in the evenings and either 15 minute (471/472) or 30 minute (1,2,X2) frequency on Sundays. The Quality Partnership also allows tickets issued by either bus company to be used on both companies’ buses on these routes. Councillor Liam Robinson, Chair of Merseytravel, said; “Both bus companies are to be congratulated on joining in these partnerships with us which is part of our continuing efforts to provide the region with the best possible public transport service.